UK 1st/1st HB signed lined and dated by the author to the title page. Synopsis : Signed, lined (with a hand-written quote from the book) and dated by the author to the title page. Synopsis : Mint and unread - signed, lined (with a quote from the book) and dated by the author to the title page. Six years after the phenomenal success of The Time Traveler's Wife, Audrey Niffenegger has returned with a spectacularly compelling and haunting second novel set in and around Highgate Cemetery in London. When Elspeth Noblin dies of cancer, she leaves her London apartment to her twin nieces, Julia and Valentina. These two American girls never met their English aunt; they only knew that their mother, too, was a twin, and Elspeth her sister. Julia and Valentina are semi-normal American teenagers -- with seemingly little interest in college, finding jobs, or anything outside their cozy home in the suburbs of Chicago, and with an abnormally intense attachment to one another. The girls move to Elspeth's flat, which borders Highgate Cemetery. They come to know the building's other residents. There is Martin, a brilliant and charming crossword puzzle setter suffering from crippling obsessive-compulsive disorder; Marjike, Martin's devoted but trapped wife; and Robert, Elspeth's elusive former lover, a scholar of the cemetery. As the girls become embroiled in the fraying lives of their aunt's neighbors, they also discover that much is still alive in Highgate, including -- perhaps -- their aunt, who can't seem to leave her old apartment and life behind. 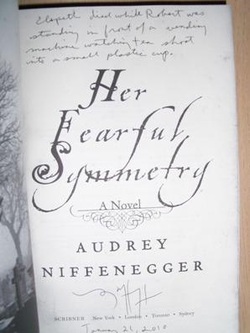 Niffenegger weaves a captivating story in Her Fearful Symmetry: about love and identity, about secrets and sisterhood, and about the tenacity of life -- even after death.